Deciduous tree, a hybrid, a cross of Acer rubrum (Red Maple) × Acer saccharinum (Silver Maple). There appears to be some confusion, or differences of opinion, as to what selections are A. 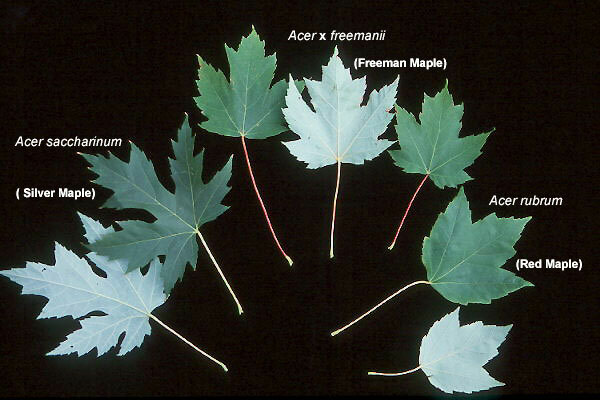 × freemanii (Freeman Maple) and which are A. rubrum (Red Maple). One authority and/or nursery catalog may list a particular selection (e.g., 'Armstrong') as a form of A. × freemanii, whereas another may identify it as a selection of A. rubrum. A hybridizer at a major wholesale nursery provided the following insight regarding Red Maples and its hybrids with Silver Maple: "various degrees of interbreeding has occurred between silver and red, including lots of backcrossing. So there are plants that are 50/50, 90/10, etc. Also, I have noticed that in the wide geographic range of Acer rubrum, certain localities appear more Freeman-like than others". 'Armstrong' - upright, narrow, 50-70 ft (15-21 m) tall and 15 ft (4.5 m) wide, silver gray bark, leaves 5-lobed, rather deeply cut, appear intermediate between Red and Silver maple but tending toward Silver maple characteristics, a female clone, fall color erratic, poor, yellow-orange. Armstrong Two™ - possibly more dense, tighter form than 'Armstrong', reportedly has better fall color (orange-red), however, some authorities do not see any differences. Autumn Blaze® - upright branching, broadly oval, 50 ft (15 m) tall and 40 ft (12 m) wide, fast growing, leaves deeply cut, 5-lobed, resembling Silver Maple, excellent orange-red fall color. Celebration™ (syn. 'Celzam') - upright habit, dense foliage, 45 ft (14 m) tall and 25 ft (7.5 m) wide, leaves deeply lobed, a male clone, fall color from yellow-green to red and gold. 'Morgan' - open habit, oval rounded, very fast growing, to 45 ft (14 m) tall and 40 ft (12 m) wide, a female clone, leaves large, deeply lobed, orange-red to red fall color. Sienna Glen® - leaf with almost a cutleaf appearance, deeply 3-5 lobed with a long central lobe; color is medium green above and light green to gray below, fall color is yellow, orange-red to burgundy. freemanii: named in 1969 after Oliver M. Freeman of the U.S. National Arboretum who, in 1933, raised the hybrid selection of A. rubrum × A. saccharinum. Oregon State Univ. campus: several in the parking lot behind Ag. and Life Sciences (possibly 'Armstrong').